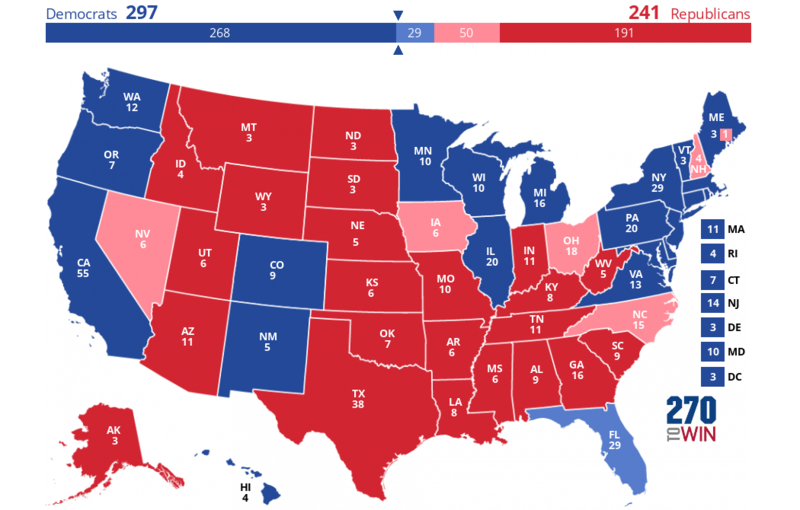 Predictions are as ridiculous as the main stream media – nothing but guess work at best. Votes have not been counted. Predictions based on polls – polls mean absolutely nothing – they are a sample, and are biased based on the person or organization setting up the poll. Registered voters exceeds past years, and the primaries, especially republican, garnered the most votes in U.S. history. One must also take into account the “coming out of the wood work vote” which can’t be guessed or polled – these are the people who have not typically voted, are fed up, mad as hell, and have had enough of the establishment. This boils down to those who will or will not vote a criminal into the presidency – right versus wrong, good versus evil, conservatism versus liberalism. If Clinton wins, we have a constitutional crisis – ongoing investigations of her illegal email servers, the clinton foundation and other illegal activities, her health – seriously doubt she will survive a four year term – first dead woman president as testified by Bill Clinton. Hillary Clinton’s private email server is illegal, it “disqualifies” her from holding any federal office. Specifically, U.S. Code Title 18. Section 2071. Explicitly states “shall forfeit his office and be disqualified from holding any office under the United States.